Some bookshops are, according to Twitter, responding by banning phones, while others are posting signs discouraging you from buying elsewhere. I can’t help thinking both are problematic – banning phones stops those of us who like to alert our friends to what’s in stock/on offer from using pictures to do so; while the suggestion that you should be buying a book in the first place you saw it doesn’t really work for me. Personally, I love browsing in bookshops I haven’t visited before, and generally try to buy something, but the majority of my purchases and pre-orders are made in my favourite few shops. Bearing in mind the general climate at the moment, I was intrigued to see what tack Mark Forsyth would take in this essay, specially commissioned for Independent Bookseller Week, and was delighted to read it. Rather than being an anti-Amazon rant, it’s a persuasive and well-judged tribute to the big advantages that your local bookshop will always have over Amazon. 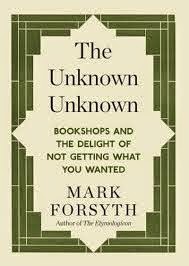 Forsyth borrows Donald Rumsfeld’s concept of the ‘unknown unknown’ to discuss just how pleasurable it is to discover something you didn't know you were looking for, using examples including Romeo & Juliet, and Elizabeth Bennet & Mr Darcy, to back up his points. I don't want to go into too many details here as it's a short, quick read, and I'd rather you found out for yourselves just what Mark Forsyth says, but please do go out and get it! I think his arguments are strong enough that you'll be visiting your local bookseller at least twice - once to buy this one (a steal at a mere £1.99), and again to pick up some more books. This is available this week ONLY from indie bookshops - I believe it will be available elsewhere from September, but you definitely don't want to wait that long to read it!